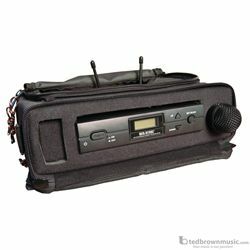 Padded Bag for A Single Wireless Microphone System. Designed for a single wireless system to be used in the case with access for an antenna to be extended while in the case. Space for lavalieres, cables and wireless microphone with transporter mounted. Front and rear access unzips for easy setup in the field and shoulder strap mobility.